Holy cannoli, what a cupcake! 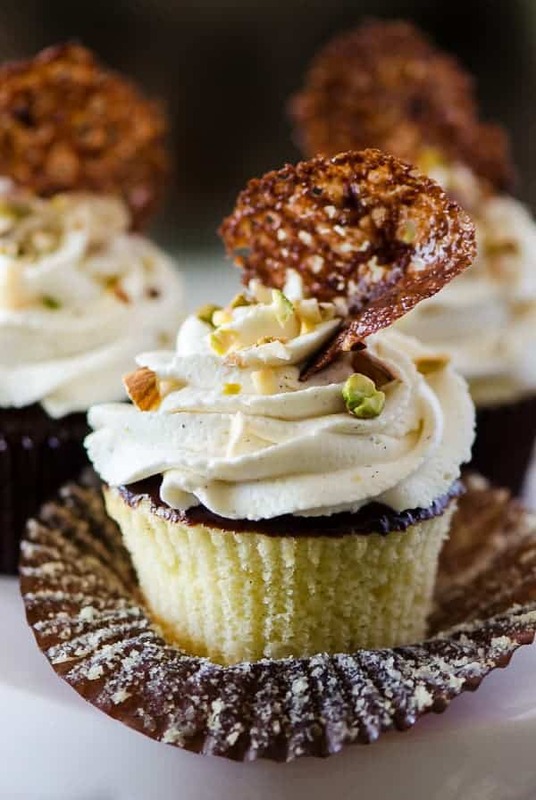 These vanilla-almond Cannoli Cupcakes are stuffed and topped with a classic sweet ricotta filling, glazed with a layer of chocolate ganache, and garnished with some pretty fancy food art. Cannolis make me want to dress up like Whitney Houston and start belting that ballad from The Bodyguard. Only instead of Kevin Costner, I’m cuddling chocolate chip-studded sweet cream and crispy shells. 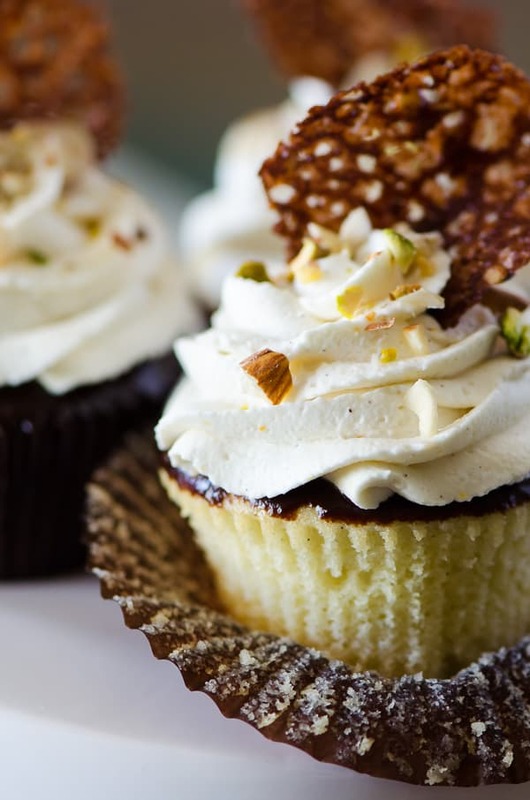 As for cupcakes…they aren’t just my (blog) namesake, they’re my life. Literally. They’re an integral part of my day job and this moonlight situation I have going on here. I have been at this blogging thing for almost two years already, guys. TWO. And in the grand scheme of internet things, that’s like…nothing. The funniest part about me even being a foodie at the age of 32 is that I was basically the opposite of one from birth to probably 22 or 23. I mean, there are still things I won’t touch with a 10-foot pole (hello every olive ever, goat cheese, and lamb? That’s your cue,) but for the most part, I’ve adapted quite nicely to working new things into my diet and actually enjoying them. I tried my first cannoli something like 5 years ago. 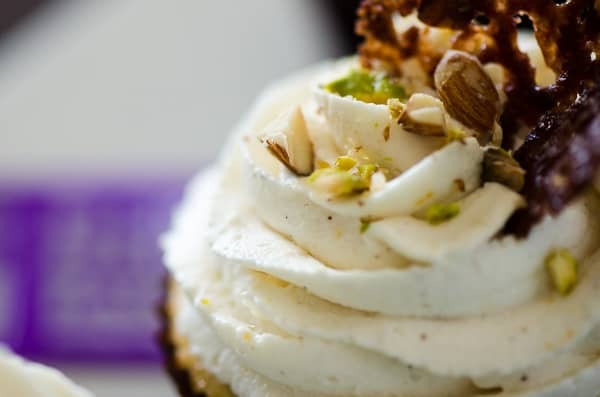 In New Jersey – Hoboken, actually, in a little shop you’ve probably never heard of…Carlo’s Bakery? It’s pretty laid back, nothing to write home about. Regardless of which celebrity chef may or may not own it, that cannoli turned me on to the beauty of ricotta cheese, especially of the sweet persuasion. I’ve always been a fan of milk, thankfully, dating way back to my chocolate milk bottles as a baby (I have photographic proof – tell me that has nothing to do with my vicious sweet tooth,) and I’ve been lucky enough to grow up in a state where over 130 dairy farming families have remained true to their values & have been committed to producing a fresh supply of wholesome, quality milk for generations. Heaven bless those 123,000+ Holsteins for repping Florida in over 277 million gallons of milk all over the country. Can you picture that much milk? If you do the math, that equals out to each cute little moo-moo producing 6-8 gallons a day! I’m starting to think I need a cow of my own to keep up with all the dairy recipes I’ve made lately. Remember those Banoffee Cream Puffs I made a few weeks back? Coincidentally, they were entered in a Florida Dairy recipe contest for the Food Wine Conference…and they won second place! It was fitting that I was also their brand ambassador for the weekend, spreading the milk love! Also slightly on the side of coincidence and worth noting is the fact that my third prize-winning recipe contest entry for last year’s conference was cannoli based. Needless to say, I’m vitamin-loading (9 types to be exact) and getting my recommended daily dose of dairy (3 cups) whether it’s in a glass, a bowl, or on a plate. Sometimes Straight Outta the Gallon. Ain’t nobody got time for cups when you need a milk fix. Our Florida dairy farmers are not only providing the country with delicious milk, they’re helping the environment – keeping about 170,000 tons of byproducts such as citrus pulp, brewers’ grain and whole cottonseed out of landfills and using them to feed their sweet dairy cows instead. While irrelevant, I love the idea that my gallon of milk might have been made in part by a bottle of my favorite Florida craft beer. Just saying. Taking the time to learn about what goes into producing the foods we buy can be quite an eye-opener. We heard a lot of great stories at the conference from local strawberry growers, potato and cattle farmers, and vineyard cultivators; the products we so frivolously toss in our grocery carts week after week obviously come from great animals and produce – but most times, we fail to see that they’re cultivated by truly amazing people, as well. Think about that the next time you pour a cold glass of Florida milk to go with your fresh-baked cookies. 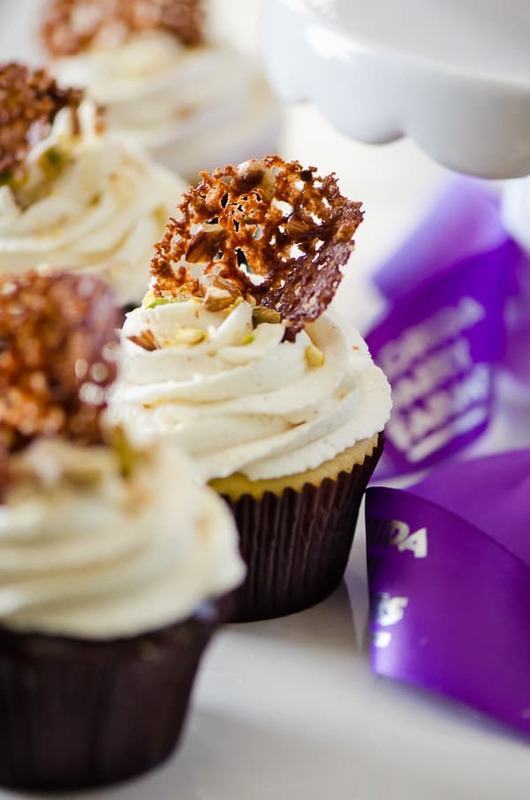 Or these cupcakes, for that matter. 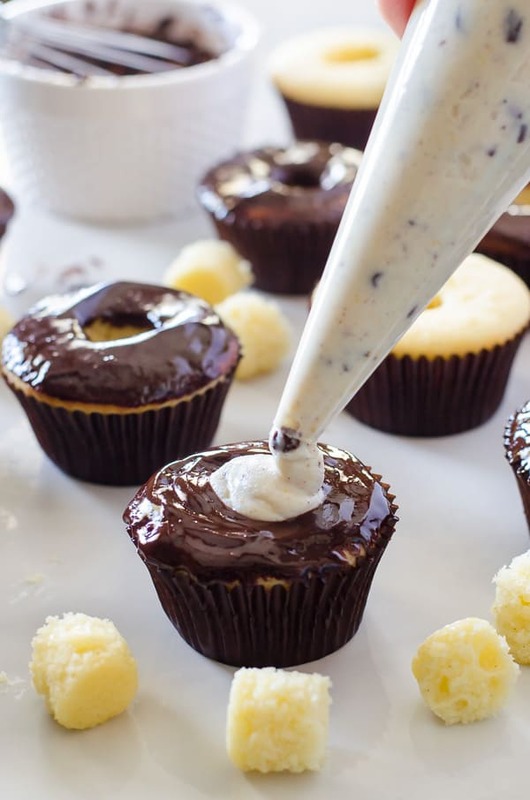 You have to make these cupcakes. You don’t have to go crazy and use your own homemade ricotta (though I highly recommend it – it’s so easy!) – store-bought is fine (Barefoot Contessa says so,) but these pretty things are absolutely worth the effort. 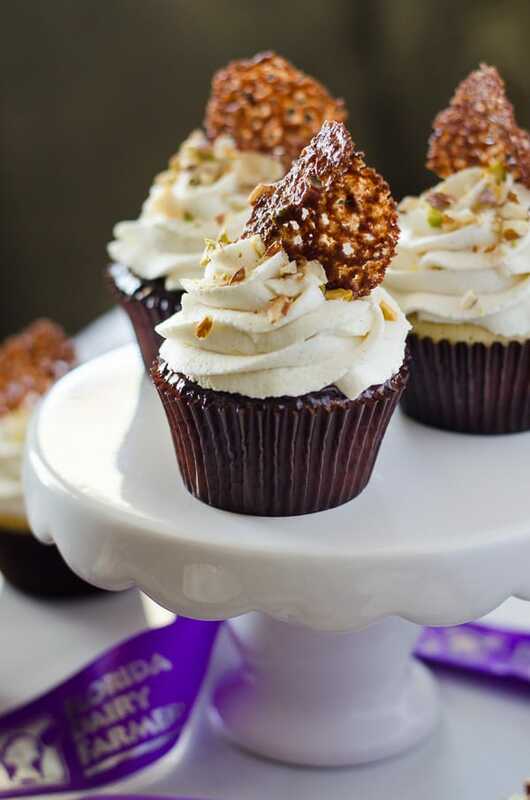 They’re everything you love about cannolis in cupcake form – and I made sure to include a crispy shell somewhere for fun texture. I even dipped them in chocolate for you, guys. Because what kind of person eats a cannoli with not even a little bit of chocolate?? No offense if you happen to be that person…but you’re totally missing out!! I was a little clumsy with this one. Or I might have dunked it on purpose. 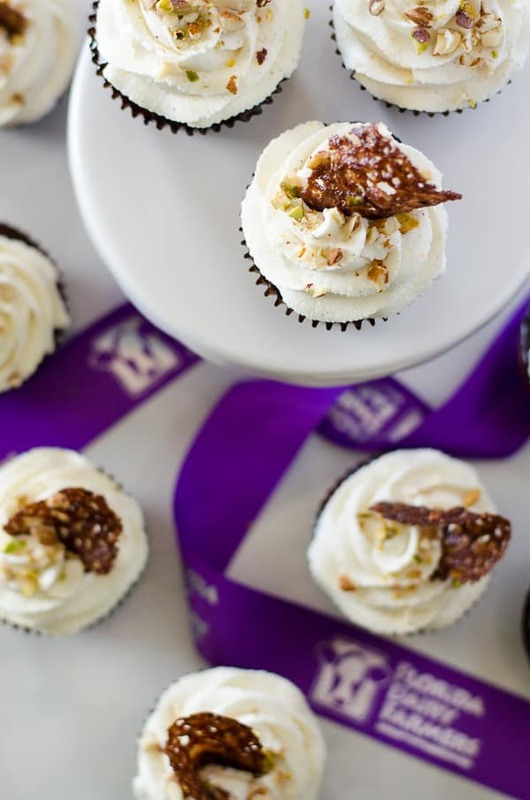 Either way, it was cannoli cupcake perfection. Pour milk, cream, and salt in a 6-quart pot. Using a candy or deep-fry thermometer to keep temperature, heat the milk to 190°F until it foams and begins to boil, stirring it occasionally to keep it from scorching. Remove from heat and add lemon juice, then stir gently and slowly 2-3 times. Let the pot sit undisturbed for 5 minutes. Line a fine-mesh strainer with 2 double layers of cheesecloth and place it over a large bowl. Pour the curds and whey over the cheesecloth, then let the curds strain for 1-2 hours until it reaches your desired consistency (thicker is better in the case of this recipe, so aim for 2 hours.) Discard the whey (or save it for later use.) Transfer ricotta to an airtight container and refrigerate until ready to use. 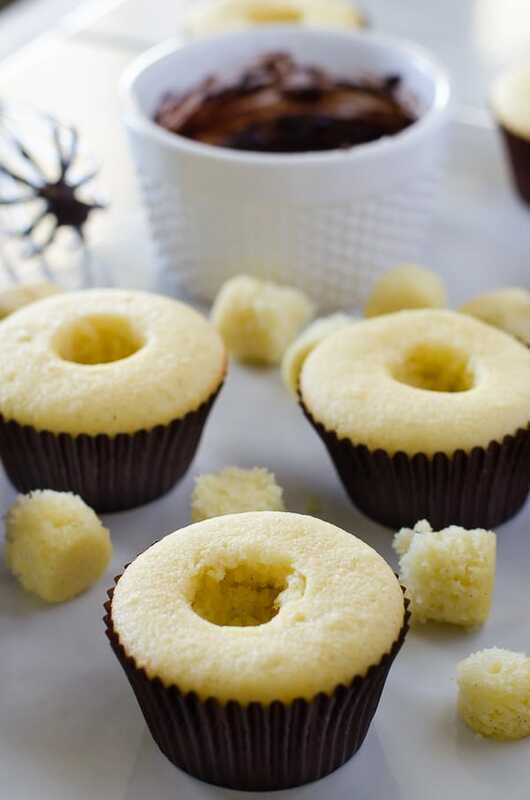 Preheat oven to 350 degrees F. Line 2 standard cupcake pans with 16-18 liners and set aside. In the bowl of a stand mixer, cream butter and sugar 3 minutes until light and fluffy. Add eggs one at a time, mixing until blended between each one. Add extracts and sour cream and blend well. Add the milk and flour mixture in alternate additions, beginning and ending with flour. Mix until just combined - don't overmix. 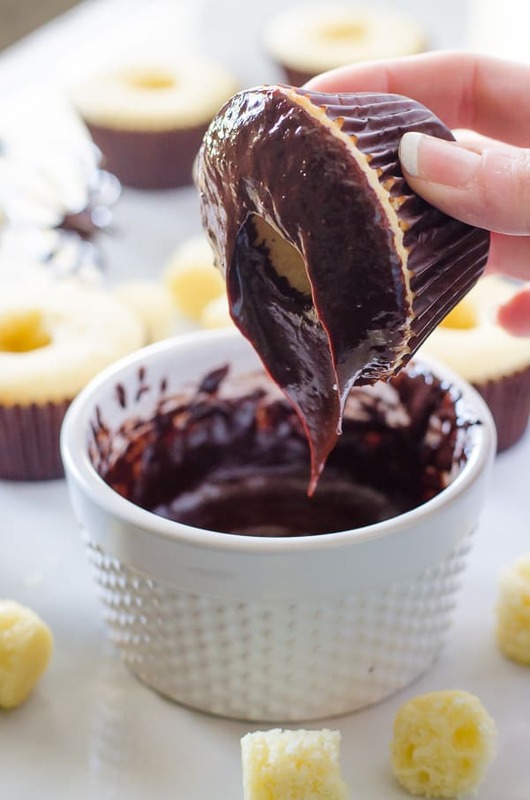 Fill the cupcake liners ⅔ of the way full, and bake for 18-20 minutes until a toothpick inserted in the center comes out clean. Place the ricotta in the bowl of your stand mixer and, using the paddle attachment, beat until smooth, about 3 minutes. Sift the powdered sugar and cinnamon into the bowl and beat until fully incorporated. Remove the bowl from the mixer and fold in the chips and orange zest. Refrigerate until ready to use, up to 24 hours. Whip the heavy cream and vanilla to medium peaks. Fold the prepared cannoli filling into cream until texture is consistent. Refrigerate until ready to use. Preheat oven to 375 degrees F. Line a baking sheet with a silicone mat or buttered parchment paper. Set aside. In a small saucepan, melt butter with the sugar and cream over medium heat. Remove from heat and stir in the flour, cocoa, and pistachios. Remove from oven and cool 30-45 seconds, until they are just firm enough to be removed with a metal spatula, but are still droopy. Quickly transfer them one by one to a rolling pin or wooden spoon handle set over a frying pan (to catch drips), allowing them to curve around and cool in shapes for 3-5 minutes. If you prefer flat cookies, simply transfer them to a cooling rack. 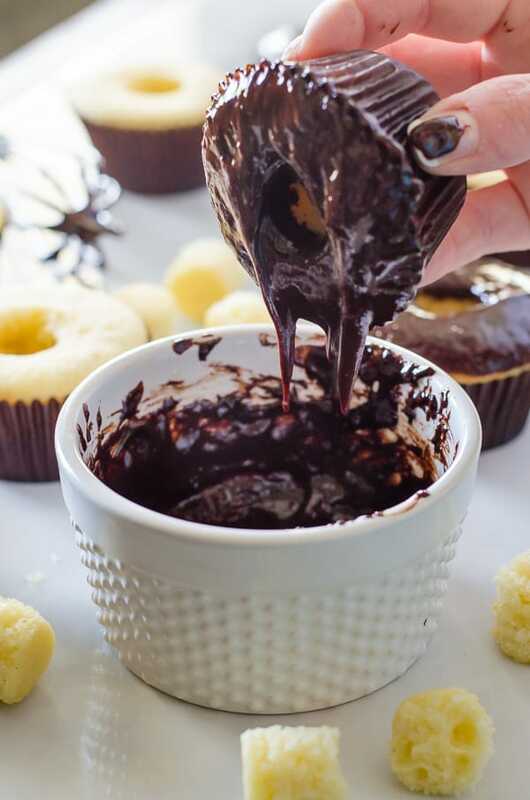 Dip cored cupcakes in ganache. 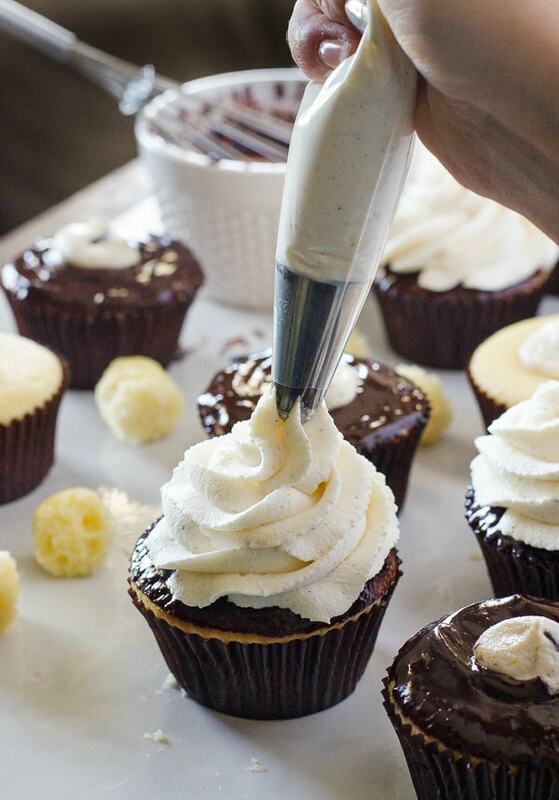 Spoon cannoli filling into a piping bag and fill each cupcake to slightly overflowing. 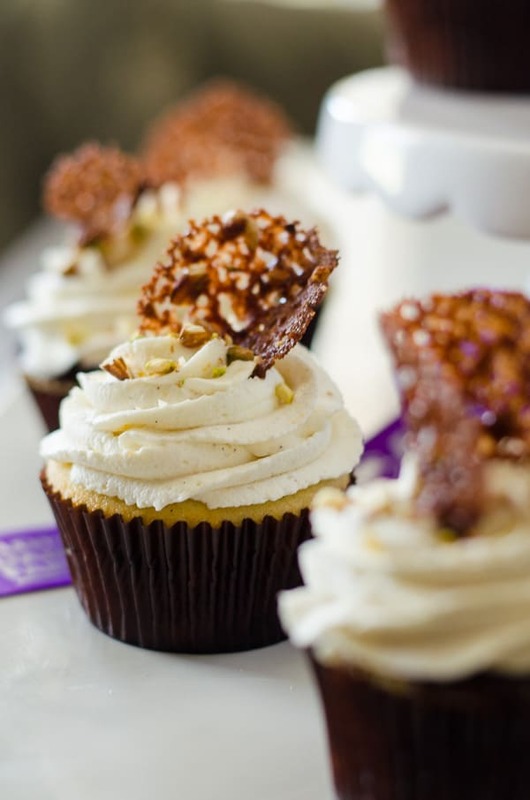 Fill a second piping bag (fitted with a star tip) with Whipped Cannoli Frosting and swirl on top of each cupcake. 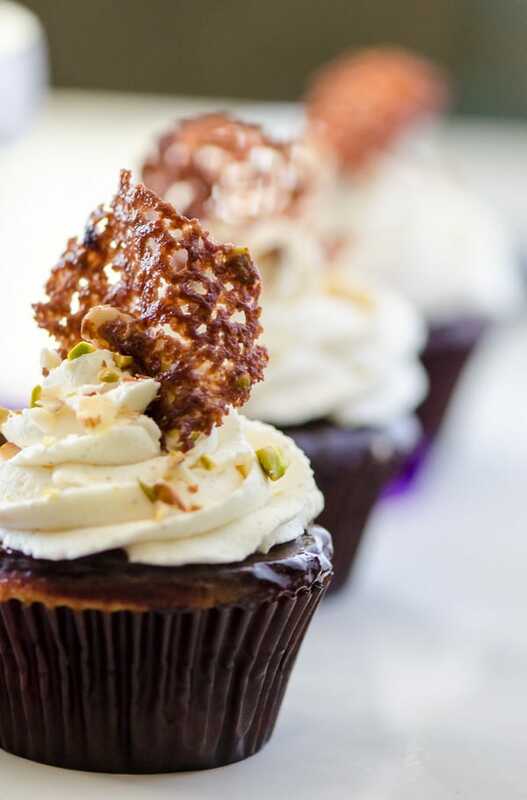 Garnish each cupcake with chips or nuts, and top with a Chocolate Pistachio Lace Cookies. Serve and enjoy! Homemade Ricotta Cheese recipes adapted from Smitten Kitchen. Cannoli Filling recipe adapted from Alex Guarnaschelli. Follow our friends at Florida Dairy on all their social media channels and celebrate Dairy Month with them! Imagine a #SundaySupper all about dairy…oh wait, it’s today! Yup…that’s drool I just wiped off my keyboard. Honestly, I could go for one of these lovelies right this minute! This recipe and YOU make me so happy. And this post confirms that we would totes get along amazingly in real life because I feel the same way about olives, goat cheese, and lamb. I’ve tried ’em, and I just can’t. 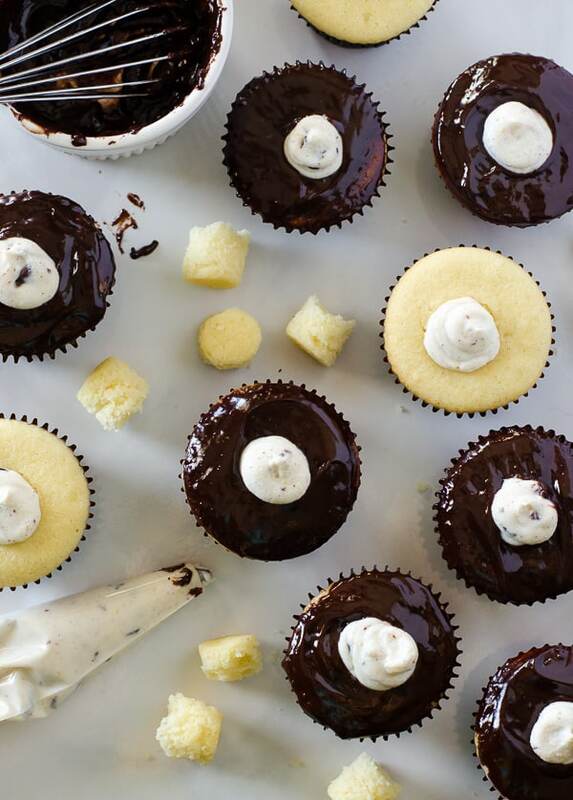 Also, when we get together in real life, can you teach me your cupcake skills? Because these are GORGEOUS, and I want to lick my computer screen. I won’t, because that seems ill-advised, but they’re tempting me. YUM. The flavors here are BOMB. Cannoli, chocolate, pistachios, my tummy is rumbling just reading about ’em! 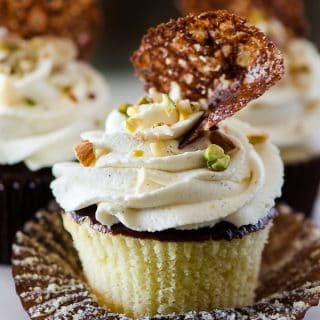 Cannolli Cupcakes?? THIS CHANGES EVERYTHING! Pinning!! This recipe is delishious! I made it for a Mary Kay Party/ my cousins Birthday and it was a hit! I however had trouble with the lace cookies, it took longer than I hoped it would take to make them and get the technique down but all in all they are gorgeous! I had a little fun with jt and made dark chocolate ganache with orange zest it in to bring more of thay citrus-sy zing! Fantastic! Kadi, I’m so glad you loved these! 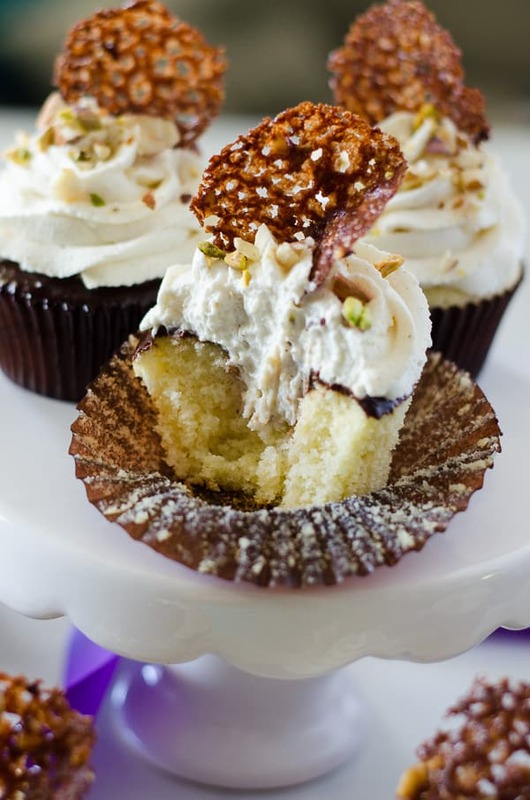 This is truly one of my favorite cupcake recipes that I’ve shared. Yes, those lace cookies are a learning curve – I probably should have mentioned that making these would have been more of a labor of love than most, but the end result is so pretty! Love the addition of the zest to the ganache – that’s something I haven’t tried, so thank you for the inspiration and the feedback! Cheers!